Trophic levels can be represented by numbers, starting at level 1 with plants. 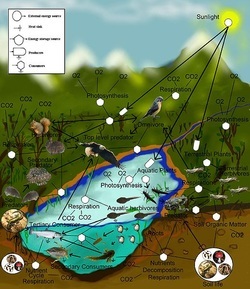 Further trophic levels are numbered subsequently according to how far the organism is along the food chain. Level 1: Plants and algae make their own food and are called primary producers. Level 2: Herbivores eat plants and are called primary consumers. Level 3: Carnivores which eat herbivores are called secondary consumers. Level 4: Carnivores which eat other carnivores are called tertiary consumers. Level 5: Apex predators which have no predators are at the top of the food chain.